A blend of fuel that’s been off the market in Iowa during the summer driving season is returning today (Friday). Gasoline that has 15 percent ethanol blended in it is now available again. Iowa Renewable Fuels Association (IRFA) Executive Director Monte Shaw says federal regulations are to blame as the newer E-15 fuel blend wasn’t given the same summer driving allowance that the commonly used E-10 blend was given 30 years ago. “As a result of that, you actually have to have two different types of gasoline to blend — one for E-10 and one for E-15. Oil companies use this quirk in federal regulations and only supply Iowa with the blendstock that is suitable for E-10, thereby freezing E-15 out of the market for three-and-a-half months,” Shaw explains. Shaw says the E-15 can be used on a majority of vehicles on the roads. “It’s approved for use in all 2001 or newer vehicles. It is not approved for smaller off-road engines. But if you have a 2001 or newer vehicle, you can use E-15 and you are going to be getting a cleaner product, a higher octane product, and it’s going to cost you less while providing the same mileage and probably a little bit of increased power,” according to Shaw. He says the inability to sell E-15 year round has kept some retailers from selling the blend, but he says they’ve been working to increase it’s availability. Shaw says 69 stations now offer E-15 across the state, which is a big jump from last year. Shaw says retailers have to stop selling E-15 on June 1st when the so-called summer driving season starts. “We are going to be working very hard between now and next June to try to get the E-P-A to fix this or Congress to fix this. We need one of those two entities to step up and say ‘this is ridiculous,’ there is no scientific basis for treating these fuels differently. It is preventing a legal fuel from being available in the marketplace,” Shaw says. OMAHA, Neb. (AP) — Bankers say weak farm income continues to weigh down the economy in rural parts of 10 Plains and Western states. The overall rural economic index for the region remained in negative territory and declined to 37.3 in September from August’s 41.1. Survey officials say any score below 50 on any of the survey’s indexes suggests a decline in that area. Creighton University economist Ernie Goss says farm income is expected to decline 12 percent over last year. That is limiting spending by farmers and hurting the economy in rural areas. Bankers from Colorado, Illinois, Iowa, Kansas, Minnesota, Missouri, Nebraska, North Dakota, South Dakota and Wyoming were surveyed. Goss says the number of farm loan defaults hasn’t increased significantly over the past year, but more loans are being restructured. Officials with the Atlantic Police Department are asking for your help in solving an incident of field vandalism. Authorities say last Sunday (September 11th), a person reported that a bean field had been mowed through, causing several paths of damage. Officials say it appears that the field was mowed with a bush hog. 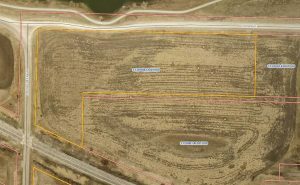 The land is located on the southeast corner of Buck Creek Rd. and Iowa Ave., in between the railroad tracks and the Schildberg Recreation Area. Anyone having information about the incident is encouraged to contact the Atlantic Police Department. Area where a bean field was vandalized. The expansion started in the fall of 2013 and, at its peak, more than five-thousand construction workers were on the site. Monson says there are about 29-hundred workers on the site this week. “By the end of September, they hope to have around 2500, end of October around a thousand,” Monson says. It’s unclear when the expanded plant at Port Neal — near Salix — will be running at full capacity. “Mid-November, they think they might be up and running, although they didn’t nail that down,” Monson says. “Could be later than that.” Ammonia is the basic ingredient for nitrogen-based fertilizer in liquid form. The expansion will triple the plant’s daily output of ammonia. The plant also will begin producing urea, a granular ingredient in solid nitrogen fertilizer. 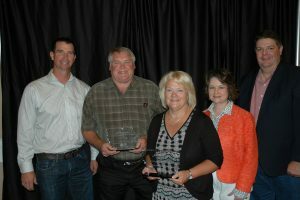 DES MOINES – The Iowa Finance Authority, Iowa Department of Agriculture and Land Stewardship and the Iowa Department of Natural Resources recently recognized the 2016 top lender and landowner of the year for their commitment to conservation practices at the Conservation Districts of Iowa Conference. First Whitney Bank & Trust in Atlantic was recognized as the top lender, and Alan Peterson of Cass County was named landowner of the year for water quality efforts. The State Revolving Fund provides low-interest loans to Iowans to assist in projects to reduce runoff in Iowa’s waterways. The State Revolving Fund is jointly administered by the Iowa Finance Authority and the Iowa Department of Natural Resources in partnership with the Iowa Department of Agriculture and Land Stewardship. The Conservation Districts of Iowa supports the 100 state soil and water conservation districts through public education, commissioner development, policy and conservation promotion. First Whitney Bank & Trust has financed more than $636,000 through the Local Water Protection Program since its inception in 2006, assisting 26 landowners with water quality improvements. The program uses linked deposit accounts to reduce the interest rate charged to the borrower; the interest rate cannot exceed three percent. Linked deposits earn no interest and are charged no fees. Alan Peterson of Cass County was named the 2016 outstanding landowner of the year for his commitment to conservation practices on his farms. He has utilized the Local Water Protection Program several times to enhance terraces, tiles and waterways on his family farm near Atlantic. “I want to thank First Whitney Bank & Trust and Alan Peterson for their efforts to preserve our waterways. Lenders and landowners like them are doing their part to improve water quality which will help keep Iowa waterways clean for generations to come,” said Iowa Department of Natural Resources Director Chuck Gipp. Harvesting will begin in Iowa soon on what some believe will be the nation’s largest-ever corn crop, but prices are still in the basement for the third straight year. On the plus side, agricultural exports for corn are picking up, according to U-S-D-A ag economist Bryce Cooke. For Iowa’s other top crop, soybeans, Cooke says national exports for June came in at 432-million dollars. “Compared with almost $1.2 billion in soybean exports in July, which is a 170% increase,” Cooke says. “That’s not necessarily a usual thing at this time of year. That, in part, is because Brazil had a bad year for production and the U.S. has, by and large, had a better year.” Overall, Cooke says July’s total export value came in at 10-point-6-billion dollars, led by a jump in soybean sales. He says the picture isn’t nearly as bright when comparing the value of the two commodities to the numbers from 2015. “The value of corn is down 5% and the value of soybeans is down 15%,” he says. Total U-S exports are down 11-percent compared to a year ago. Due to the low commodities prices and rising input costs, some Iowa farmers may face spending more than they earn this year. DES MOINES, Iowa (AP) — The Iowa Supreme Court must now decide whether to weigh in on a lawsuit that pits Des Moines Water Works against upstream farmers accused of contaminating rivers with nitrates from fertilizer. The justices heard arguments today (Wednesday) in the case, which asks the court to decide whether agriculture drainage districts have immunity from lawsuits and whether the water utility can seek monetary damages. Water Works officials say removing excess nitrate from water cost $1.5 million last year alone. The agency sued three northwest Iowa counties that oversee 10 agricultural drainage districts. The Iowa Farm Bureau Federation and corn and soybean growers associations are offering to help pay legal fees for the counties. The lawsuit, in federal court in Des Moines, is on hold until the Iowa Supreme Court makes its ruling.